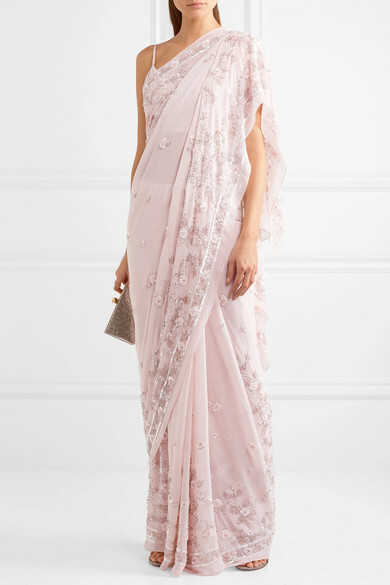 Available in two colours, white and the pastel pink above these sarees are being sold as part of Needle & Thread's bridal collection. These sarees caught my eye recently when British Indian stylist and blogger (and former cast member of the asian reality TV show Desi Rascals) KavitaCola shared some pics of her in the sari on Instagram. 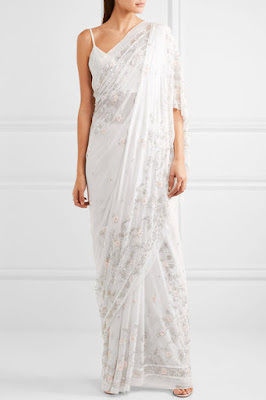 It looked like your usual pretty white sari to me, it was only when I read her blog post The Sari and My Indian Side that I noticed it was from Net a Porter. So just who are Needle & Thread, and what made them decide to include a sari in their latest bridal collection? Well, they're a British brand "working with artisans in India and the UK". The rest of their collection on Net A Porter is all about embroidered dresses, tops, skirts...and this season even denim overalls! Personally, if I had £1000+ to spend on an asian oufit, my first port of call would be Pernia's Pop Up Shop where you can shop online for collections from India's top designers. 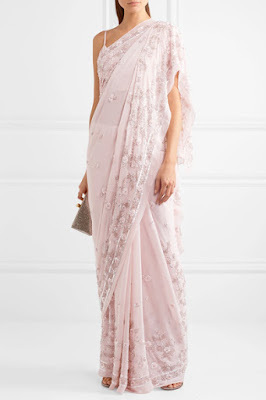 But then again I'm not a regular shopper on Net A Porter so perhaps this is just right for their customers and especially those who haven't worn Indian outfits before.